Long time ago, Catmon was once a dreary colony of heathen natives. It was nothing more than a cluster of native cogon huts that queue like mushrooms in the glade beneath tall trees that stand like green palisades along the hillsides and along the sandy beaches. A big tree called catmon also grew abundantly in the area. One particularly big tree with outspreading branches was the favorite resting place for natives. It was there that at one time, as the legend goes, where the Spaniards came upon natives lazily lolling under the shades of the Catmon tree. Interested to know the name of the locality, one asked: Como se llama este lugar?” Confounded as to what he meant, an Indio nevertheless answered: “Catmon”. He of course presumed that the conquistadores were referring to the tree. The name was accordingly given to the town. 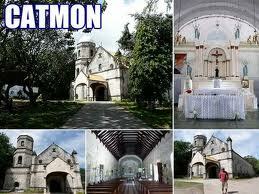 One of the barangays of Catmon, five kilometers from Catmon proper, is called Catmandaan, meaning old Catmon. This was the original site of the municipality. The public market is still in this place. The Poblacion is now along the seacoast. Construction of the church started by Fr. Miguel de Jesus was made in 1835. But it was made only of nipa and cogon. Fr, Juan Juseu in 1854 replaced it with stones and corals taken from quarries seven to eight kilometers away. Fr. Jose Miramon completed the dome of the belfry in 1873 and Fr. Francisco Bargasa put up the roofing and the altar. The municipal building was started in 1912 by Municipal President Montecillo and completed in 1917. During the revolution of 1898, Catmon figured prominently when in barrio Cambakay in Capayan mountain, Gen Maxilom retreated after his forces were defeated by the Americans. As his temporary headquarters, here he issued orders to his scattered remaining troops. Catmon was also actively involved in the resistance movement during World War II.